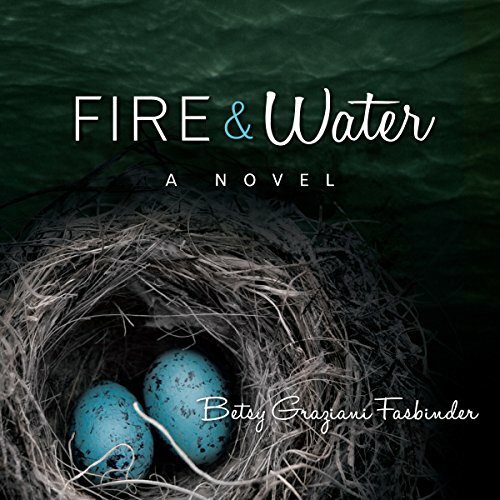 Fire & Water is a dark story of passion, family secrets, and the enduring power of friendship. Katherine Murphy, a pediatric surgeon in San Francisco's premier medical center, UCSF, was raised in the ironic protection of her father's Irish pub by a patchwork family formed of misfits and orphans. She is book-brilliant, but unwise in the ways of love and life. When genuine love and deep passion present themselves in the form of Jake Bloom, a renowned "artist of the immediate", she is in far too deep before she discovers the treacherous dark side of his creative genius. Only her shoot-from-the-lip friend Mary K sees past Jake's initial charms, but by then Kate's life has been indelibly altered. As Jake spirals into the depths of his mental illness, Kate is faced with previously unthinkable choices that demand her to search her soul and find her own true north. This is a story that redefines what family really means and proves that love is always a matter of life and death. I ended up loving this book, though I have to admit that it started out a little slow for me. What kept me with it are the wonderful characters this author created. And then I just couldn't stop listening, the story then completely won me over. It's very important in a novel told in the first person that you like that person, or at least are willing to spend 12 hours of your like with that person. Kate is very believable, both in her virtues and her faults. I also like when an author writes a child, in this case a 5 year-old, who uses age-appropriate language and doesn't come off as a miniature adult. Monica McKey does a great job with the voices. I especially liked her Jake Bloom, who is a very complex character and required some finesse to manifest. Mary K was also well voiced. I hope Ms. McKey plans on reading more audio books, as I think she is very good with the accents. If you like car chases and bombs exploding DO NOT buy this book. It is very thoughtful and literary. The writing is beautiful in itself, but the story that writing conveys will take you to new and unexpected places. Enjoy. I liked the story. I appreciated the author tackling such a sensitive topic. Unfortunately, the audio recording was irritating. Often, I heard too much breath & lip smacking. The voice/accent of Mary K was awful! What made the experience of listening to Fire & Water the most enjoyable? I wouldn't really call my experience "enjoyable" . Though I thought the book was excellent I found myself crying more than once while listening to this sad tale of a family struggling with mental illness. Nate. My heart broke for him. I get a lump in my throat just thinking about his torment. He was such a kind hearted soul. Which character – as performed by Monica McKey – was your favorite? Every character performed by Monica was my favorite ! She did a fantastic job. It was and I did ! This book was great even though it made me cry. What did you love best about Fire & Water? the characters were genuine and though the story is complex it was not difficult to follow. the relationships with all around. And how in the times of calm we want to believe there will be no future explosions. What about Monica McKey’s performance did you like? I thought she was excellent-i loved her speaking in the voice of Mary Kay. I read some reviews about timing and her sounds at times becoming a distraction. I did not experience her that way. I would love to see the book she is reading from. i can hear it with out critiquing it. diabetes 1 .and her being able to ask to be alone after she learns the outcome of her surgery. Andy Goldsworthy. In Jake there seemed to be a confrontation response to those who wished for the beauty to remain. I see this was addressed in the credits-but that was at the end of the story. Some books are ruined by the narration, but this one is enhanced by it. While it's a good love story with the unusual backdrop of hospitals, doctors and artists, Monica McKey's ability to make the characters come alive makes it fabulous. She is so talented with the different voices and accents that at times I forgot the voices were all coming from the same narrator. Monica's voice is soothing and resonant with great timbre. Easy to listen to. Would you recommend Fire & Water to your friends? Why or why not? Yes I would! Good story -- different -- and entertaining with all the characters coming alive as it's read. When Murphy finally slams back at Mary Kay after Mary Kay disses her new lover. Also the scene in the Irish pub with her dad and the guy gets drunk. Then she learns bad news that changes things for her. A tale that unravels with grace amidst danger. Nicely conceived and executed book with narration that partners with the plot seamlessly. Where does Fire & Water rank among all the audiobooks you’ve listened to so far? This book ranks fairly high, though I was surprised by the seriousness of the story. I didn't pick up the heart-stopping elements of this book from the blurb, but I am glad to have stuck with the story to the end. I had thought of putting this book down for a while, but didn't. Would you listen to another book narrated by Monica McKey? I would be cautious purchasing another book narrated by Ms. McKey. In significant portions of this book, she had uncalled-for heavy breathing and distracting mouth noises. At times, it seemed as if she was reading after just having run some miles and hadn't yet had a chance to catch her breath. The many reviewers that have rated this book 4- and 5-stars are not exaggerating their ratings. I am skeptical when a book or audio book receives an incredibly disproportionate number of high ratings, but this book earned them! I volunteered to listen to this audio book for review through Audiobook Jukebox with the agreement of providing a honest review. I will keep this review spoiler-free. If you are interested in a book summary, please refer to the book blurb or the reviews of other readers that are not spoiler-free. This love story is a bit dark. Fire & Water took me by surprise, because even though I had read the book blurb, I hadn't read other reviews of this book, so, I went in knowing little about the story. I was unprepared for the harsh moments of love to a manic depressive. Ms. Fasbinder has a wonderful way with words, poetic in description, tender in close moments, harsh in darker moments. When the title includes "art, love passion and madness", how can your interest not be touched? While I would consider this novel a woman's novel, I wouldn't call it chick-lit because when I think of chick-lit, I think of a light-hearted story, typically with a HEA and easily resolved conflicts. This is not that. This is a well-written easy-to-read character novel that will bring you to heights of love and unanticipated depths of love as well. It will bring you from the euphoria a new love to the heart-breaking reality of how a broken person affects all of those who love him, sinking loved one by blind sided heart ache. This is not an ordinary, easily forgotten novel. This is not a quick lunch at the nearby fast-food joint, but a multi-course epicurean gourmet for the senses at a fine five-star restaurant. The nuances of each layer of flavor will catch you by pleasant surprise. Monica McKey narrated the audio book, about 12 and a half hours in length for the slightly more than 400-page book. She did a superb job giving distinctive voices and relevant accents to each character and adding the emotion called for by the scene to her voice. Her reading pace was good. Unfortunately, the recording had a empty-room hollowness about it. Also, there were many and long portions of the story in which the reader had heavy breathing in her reading, which was uncalled-for by the scenes, or her mid-sentence pauses were unusually long (chapter-change long, not comma-pause long), or the reader had dry-mouth, audible mouth noises. While I have high regard for both narrators and audio book production teams that make you forget you are listening to a production, in this case, one is often pulled out of the story because of these distractions. I would recommend this book, but know that Ms Fasbinder will play with your emotions, tugging, pushing, pulling, leaving you unexpectedly moved.